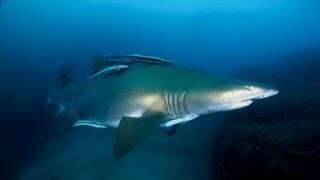 Wolf Rock Dive provides guided scuba diving tours to the amazing Wolf Rock, Australia's best shark and ray dive. Just three hours north of Brisbane they offer daily dive charters and dive courses. Wolf Rock consists of four volcanic pinnacles, located just off Double Island Point near Rainbow Beach, Northern Sunshine Coast and home year round to the critically endangered Grey Nurse Shark. As Wolf Rock is a protected area the marine life that can be found there will astound you. 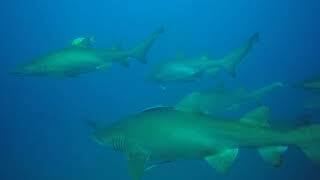 Their grey nurse sharks can be found here all year round, along with other big critters such as giant Queensland gropers, squadrons of eagle rays, bull rays, leopard sharks, green sea turtles, loggerhead turtles and manta rays. Then you have the large schools of pelagic such as trevally, kingfish, barracuda and much more. Hard and soft corals provide shelter to a wide variety of sub-tropical fish, moray eels and nudibranchs. In winter be entertained by the humpback whales on their annual migration north to Fraser Island and listen to their whale song while scuba diving. All tours are guided by experienced professionals with only small groups of up to six divers. Wolf Rock is one of the most exciting dives in Australia and will perhaps be one of the most exciting dives you ever do. For this reason, all daily dive charters are to Wolf Rock. 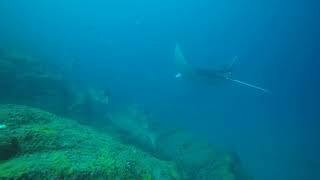 If you like to see big animals this is the dive for you. Home to the critically endangered grey nurse sharks and other marine animals such as Giant Queensland Groper (these guys grow as big as the sharks), eagle rays, bull rays, manta rays, leopard sharks, three different species of turtle – loggerhead, green and hawksbill. During winter they witness the annual migration of the humpback whales. The four volcanic pinnacles that make the site of Wolf Rock are also covered by hard and soft corals providing homes to all the small animals that are the lifeblood of any reef. Nudibranchs, octopus, sub-tropical and temperate species of fish, crabs, sea stars, wobbegong sharks and more. Wolf Rock Dive Centre offer day charters for small groups of certified divers, and courses up to Divemaster level. Charters run on a daily basis weather permitting and all diving is conducted from their six metre aluminium duck which has been purpose built for diving.